The Invacare Bariatric Drop Arm Commode is built with durable steel construction and is designed with a wide and deep seating surface for individuals weighing up to 1000 lbs. 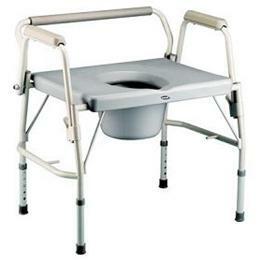 The commode comes with easy to operate drop arms that accommodates transfers in and out of the commode. The drop arm commode also has an extra-wide snap on seat and backrest and also has height adjustable legs.